Around 380 million people of the world are suffering from type ll diabetes and most of them are also suffering from obesity. 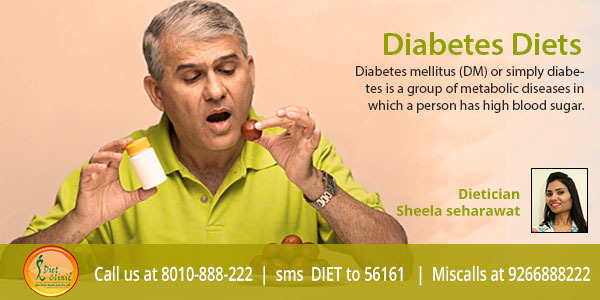 Diet Clinic is providing therapeutic diets for people who are suffering from diabetes. Our diet consists of combination of foods which are very low in glucose. We have added fiber rich fruits and vegetables to the diet plan for better digestion. It is a metabolic disorder, so a daily walk is a must to cure it. Contact Diet Clinic for early recovery. Diabetes diet also called MNT (medical nutrition therapy) is a diet that helps you control the levels of sugar in your blood. Diabetes is a medical condition (disease) where the body is not able to properly maintain levels of insulin in blood. It can be either caused by the fact that the body cells are not able to properly digest insulin or that pancreas is not producing enough. With diabetes it is very important to be careful about your food – what you eat as well as about the timing of your food. With diabetes regular eating is very important and you should try not to skip meals during day. There are some types of foods that should be included in your diet, such as: healthy carbohydrates, foods rich in fibre (vegetables, fruits, whole-wheat flour, beans), fish and ‘good’ fats (for example fats present in avocados, nuts, olives). However, you should be careful with the fats as they contain high calories. In your diet you should try to avoid eating food that contain saturated fats, sodium, trans fats and food high in cholesterol. Here at diet clinic we will help you to plan a diet that is suitable for diabetes and at the same time taking into consideration your eating habits and lifestyle. Following our diet, you will be not only eating healthy but also it will help you lose weight, which is one of the important parts in successfully battling diabetes. With our diet you will also reduce the risk of further complications such as heart attack. Join us and together we will make your life happier and healthier.